Russian designer Mikhail Kalashnikov, creator of perhaps the world's most famous firearm, passed away today at the age of 94. He leaves behind a somewhat complicated legacy. Born in 1919, he was a tank commander in the Second World War, but in his spare time was also a keen inventor. While spending time in a hospital recovering from wounds sustained in combat, he was inspired by complaints from fellow soldiers to invent a better rifle for the Red Army. In 1944, he designed a weapon that, after a few revisions, would go on to be known as the AK-47, which entered service with the Red Army in 1949. The AK-47 has gone down in history as the most popular assault rifle of all time, ending up in the hands of countless millions of soldiers, police, drug runners and terrorists the world over. Kalashnikov's weapon didn't just have a big influence on the world's armies; it's had a strange cultural impact as well, on everything from rap music to, yes, video games. The AK-47 - and its successor, the AK-74 - is one of the few weapons in video game history whose characteristics are so widely-known, so embedded in our consciousness from years of experience, that you don't even need a tutorial or guide to explain what it is. As soon as you see that curved magazine, you know you're getting a weapon that's not terribly accurate. It's not pretty, either. But from Uncharted to Call of Duty, it works in games just like it does in the real world: it packs a hell of a punch, spits bullets at a terrifying rate and, most importantly, you can find one (and its ammo) lying around just about anywhere. 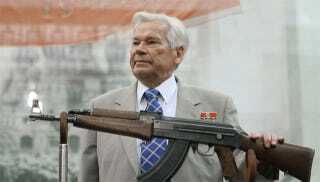 Passing away peacefully at the age of 94, Kalashnikov's legacy is a tough one to sort through. He was a masterful designer and engineer, responsible not just for the AK-47 but over 100 other weapon designs. He's one of the most decorated men in Russian history. And yet, for all the excellence of his designs, the end product has been one of the most destructive in human history. Something that sometimes bothered even Kalashikov himself. On a trip to Germany in 2002, he famously said "I'm proud of my invention, but I'm sad that it is used by terrorists. I would prefer to have invented a machine that people could use and that would help farmers with their work - for example a lawnmower."